Easy stir fry recipes are a boon when you want to eat something fast AND healthy that won’t promote fat storage! Once you know how to stir fry, making a healthy meal gets so much simpler. You do not need a wok and this isn’t about using one. This is for people who have regular frying pans and just want to create a fast meal with meat or fish sautéed with vegetables quickly. There is a formula to use and a few specific principles. Stir frying is meant to be at high heat with a minimum of cooking. However, high heat destroys nutrients and can create transfats so I say just use moderate heat for a bit longer cooking time. Always use unrefined oils because they have the least chance of being damaged by the processing. Olive, peanut, coconut and sesame oil can be used for cooking but be sure they are high quality, unrefined oils. Start the rice in a rice cooker or on the stove. If you’re using the stove top heat 2 cups of water to a boil and add one cup of brown rice. Cover with a lid and simmer for about 40 minutes or until all the water is absorbed. While your rice is cooking wash and prepare the vegetables. Heat the oil in a sauté pan and when it’s hot, add the sliced garlic. Stir and fry until it is starting to brown and has become fragrant. At this point add the carrots and cook for 5 minutes. Then add the prawns and stir them with the carrots until they are opaque. When the prawns are almost done, add the asparagus. Add the oyster sauce 1 T. at a time and taste. Stir continuously until the vegetables and prawns are cooked through but the veggies are still crunchy. The asparagus and carrots will be slightly tender. Add the palm sugar at the end of the cooking a sprinkle at a time tasting for just the right flavor. Turn off the meat and vegetables and cover with a lid until your rice is done. Add the rice and combine thoroughly before serving. This could make a complete meal or if you wish serve with a simple salad. 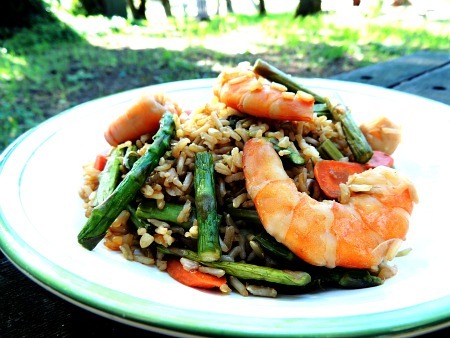 Return from Easy Stir Fry Recipes to Low Glycemic Recipes. Return from Easy Stir Fry Recipes to Lifetime Fat Loss home page.